Ken Woods. Ken Woods, long flower spike form. 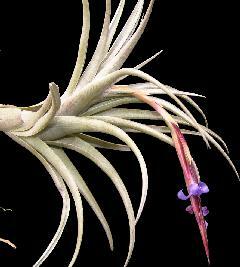 Ken Woods, short flower spike form. Brenton Cadd 12/16 George Nieuwenhoven 12/15 from Bolivia. 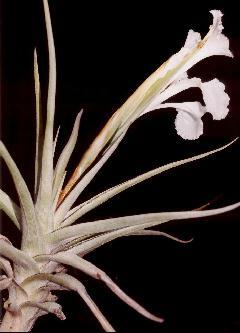 Brenton Cadd ... "here is one that I got from Len back in 2002 and this is its first flowering for me. Mind you it has grown a fair bit for me in that time, it was a small pup when I got it. Len had it named as xiphioides small caulescent, the folage is about half the length or less of an average xiphioides but as you can see it is caulescent. So far it has only given me the one pup right at the base of the original plant. 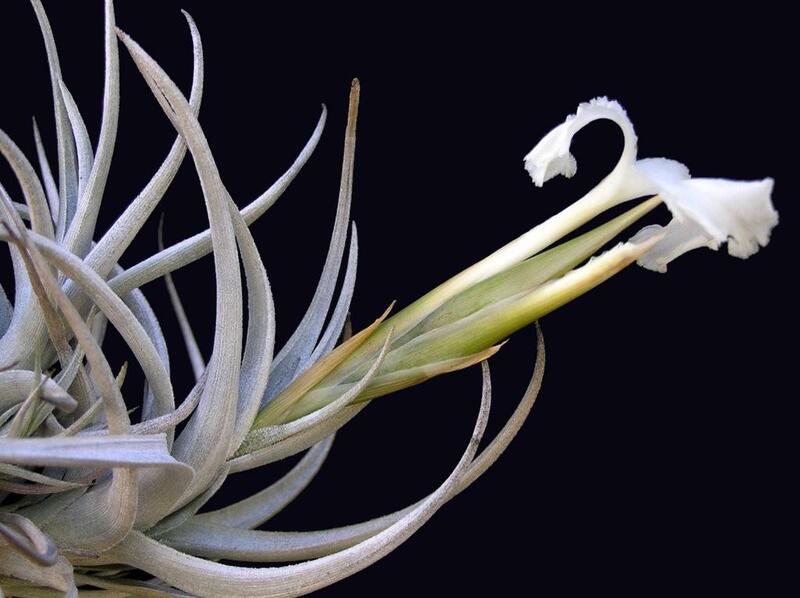 Since I have taken the photo I have cut the main stem into four lenghts to see if I can get more pups from it, it will be interesting to see what happens." 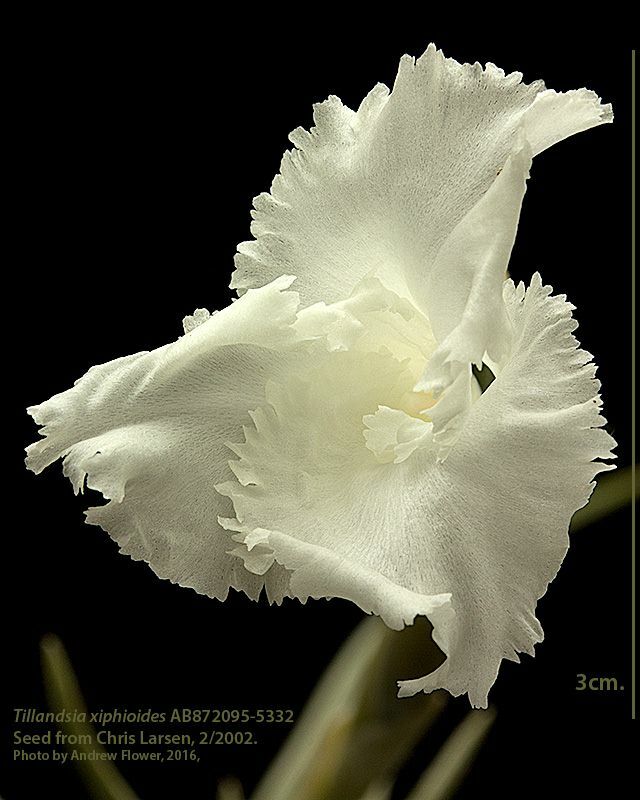 George Nieuwenhoven ... "I can confirm that is has a strong scent a bit like a Gardenia flower, thanks to Len this plant is finding its way into many collections." 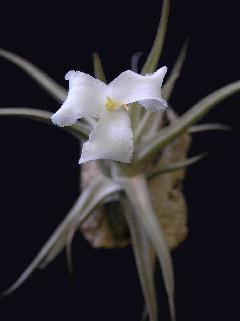 Andrew Flower ... "Currently flowering here, T. xiphioides "small form, Argentina" grown from seed supplied by Chris in February 2002. 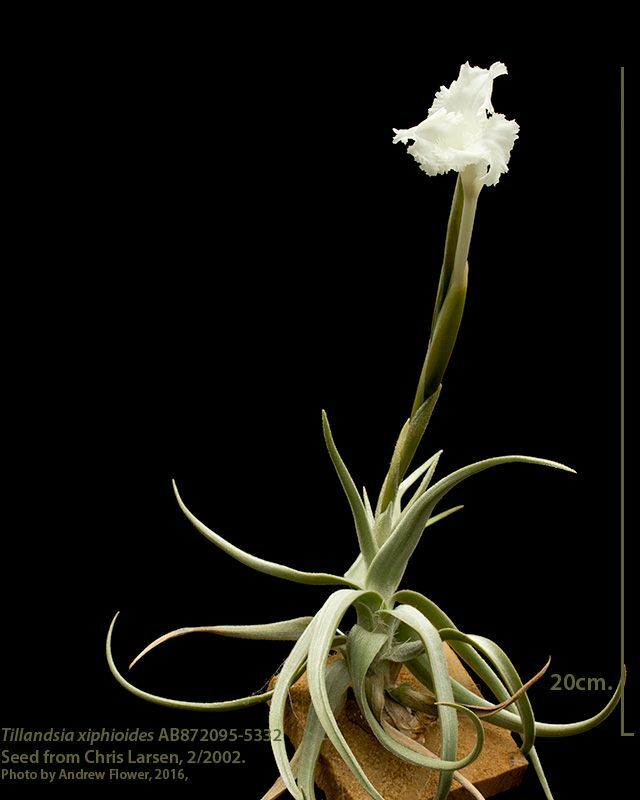 Interestingly this one from Chris's "small form" seed (17cm dia., 20cm tall in flower, inflorescence 3cm dia.) is pretty much the same size as other xiphioides I have imported over the years. A smaller xiphioides I have is one from seed I collected 76 Km east of Cachi, and it has an inflorescence starting at present while the plant is only 11cm. dia. Do you have any information on where your seed originated, and what sort of size Mum was Chris? 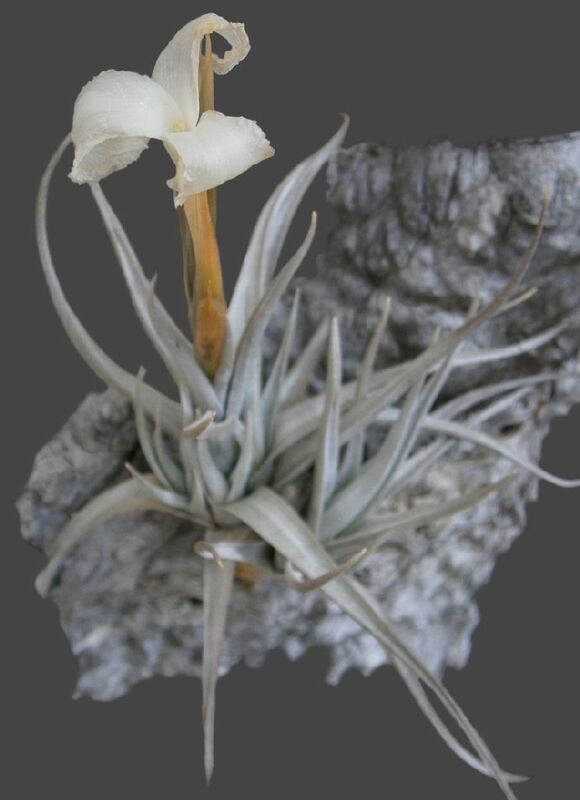 I appreciate that tillandsias raised from seed in cultivation are likely to vary considerably in size compared to those grown in their natural habitat, and indeed they vary greatly in cultivation too. Thanks again for the seed." Ken Woods 01/10. KW, larger clone 01/10. Ken Woods 02/11. I did not really get very close to the habitat in either of my expeditions to Bolivia, although I did travel through the west and centre of the correct province, Chuquisaca. 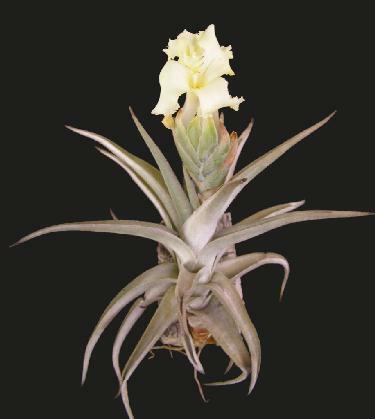 It grows on the eastern side of Chuquisaca, at a latitude roughly halfway between the general area where the different coloured forms of T. streptocarpa and T. duratii live and the southern province of Tarija. But that is a long way! 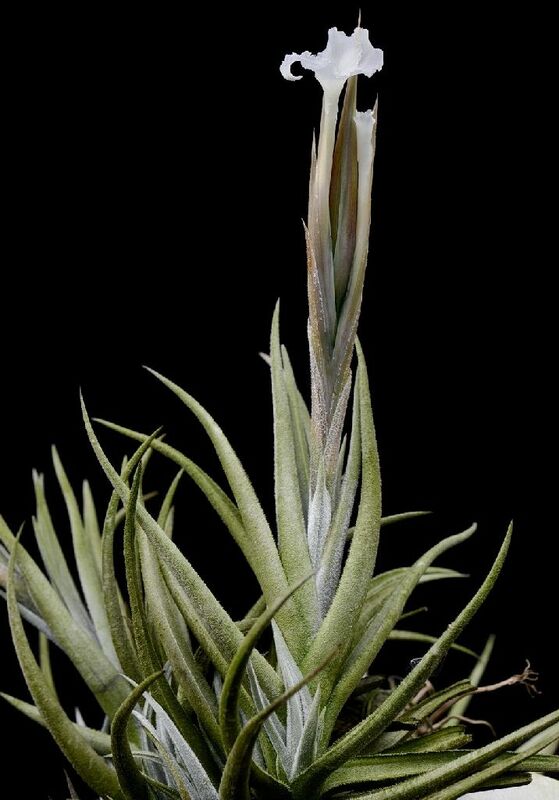 It is also at a lower altitude (of about 1300m) than most of the forms of T. xiphioides that I personally collected, but about the same altitude as the different coloured forms of T. streptocarpa and T. duratii (which grow much further north). I obtained a specimen from Lotte (the discoverer) many years ago. I think Derek got his original plant from her also. Whereas Derek managed to flower his plant, my inflorescence aborted for some reason. But it gave me a number of offsets that were progressing beautifully until our 47C heat wave early this year. The large clump got badly burnt, and is only now showing signs of some recovery, albeit with 90% of the leaves removed and plants separated. I am sure I gave one or two people a pup at some earlier time. Lotte described the colour of the petals as “yellow”. 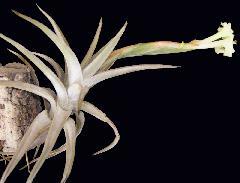 However, having seen Derek’s plant, plus some in Europe, and now Peter's pictures attached, I would say that the colour varies from creamy-white through to creamy-yellow. Cream is probably an average description. Above extra picture is from my “Bolivian Tillandsias” presentation for everyone’s benefit. I think the petal colour is a bit “creamier” (Photoshop not used!!). 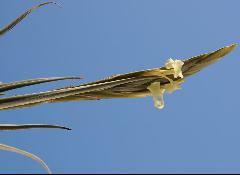 Peter Tristram 28/10/13 ... "Many of you will be blooming T. xiphioides at this time of the year. Apart from the lovely white flowered forms I also have a more compact clone of the variety lutea flowering. These are very slow growing. 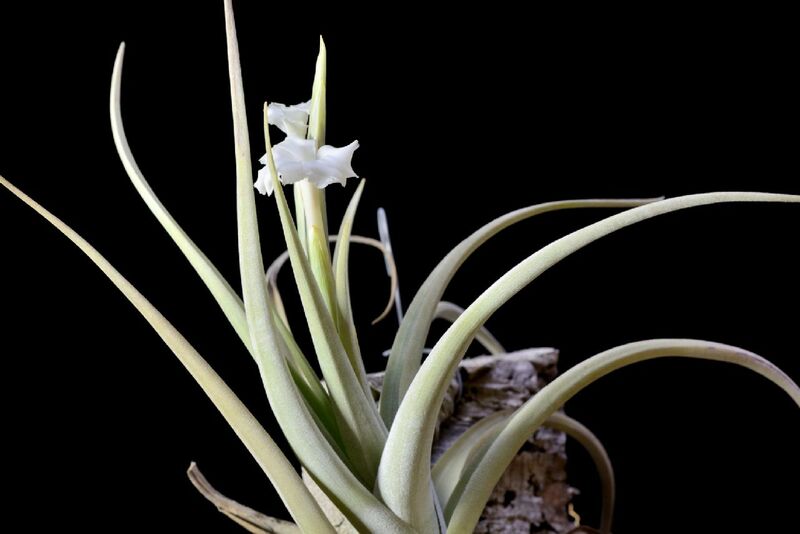 The only source of this species that I know of is Lotte Hromadnik and she likely grew them from seed collected about 1980. It is reported from about 1300m, low for Bolivia, and the localities listed in the description and her database seem odd for xiphioides – in the Amazon basin, or I can’t locate them. I wonder if Len travelled the area of Chuquisaca Department and can narrow the habitat down?" 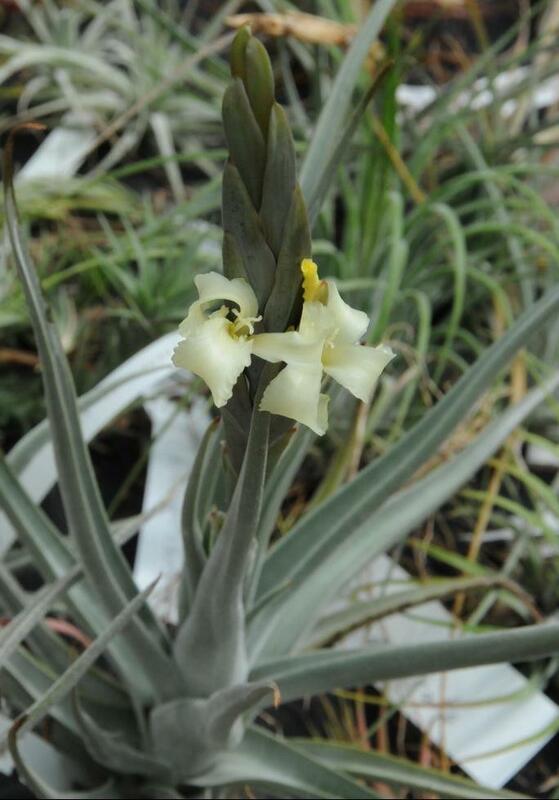 Len Colgan 29/10/13 ... "I have had T. xiphioides var lutea for many years, also from Lotte. 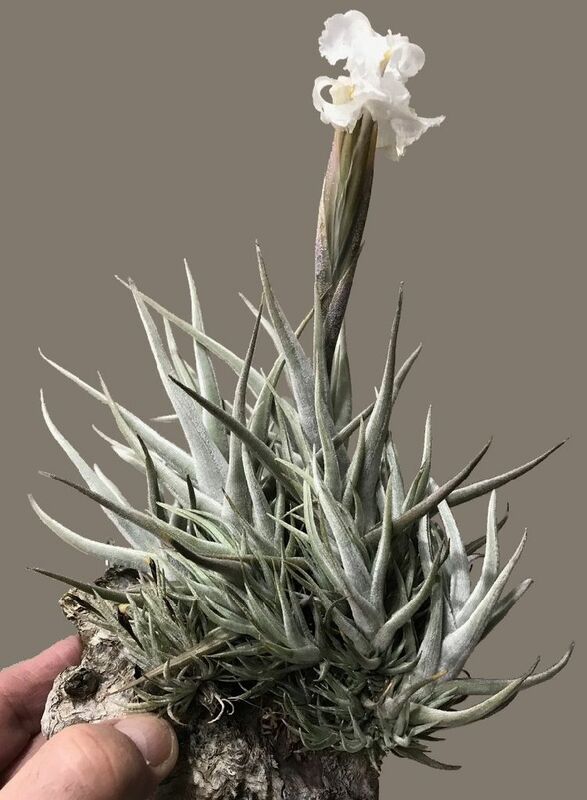 However, it did suffer in the horrendously hot day a few years ago when hundreds of my tillandsias died, and consequently is yet to flower for me. Yes, I did travel through the state of Chuquisaca which, from memory, is directly north of the southernmost state of Tarija, and covers a lot of the Andean mountains. Hence, even at an altitude of just 1300m, I would expect to find T. xiphiodes. The lowest altitude I ever descended to was about 1000m in Tarija, from where I collected at least three different forms of T. xiphiodes. Unfortunately, we did not go near the type location of var lutea, which is why I had to get it from Lotte herself. I think Derek flowered it, with pale cream flowers. Is that the case, Derek?" Derek Butcher 30/10/13 ... "Yes, I have flowered it but it must be bleaching by the Adelaide sun because I can't get the yellow that the Germans get. This got me thinking as to whether it was worthy of varietal status." Peter Tristram 30/10/13 ... "Hi UD, I can assure you the flowers are pale yellow NOT white, just a tad more though, than in my photos. I should take a comparative pic. If I had tweaked the white balance I might have nailed the colour. Then, maybe you scored a dud colour-wise! I have at least 1 other clone budding so let’s see how yellow it is. Len, thanks for the habitat info. 1300 m would be quite warm I imagine. Love to go there one day!" 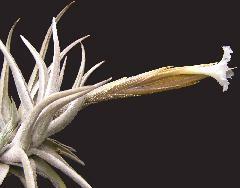 Steve Haines 2/11/13 ... "As Peter mentioned it is xiphioides flowering time, I have a few different kinds flowering at the moment, here are some pics. 1st photo; T. xiphioides var tafiensis, large and somewhat translucent,white flower that is shortlived. 2nd; a small compact form from Maurice that come from Germany, small but brilliant white flowers. 3rd & 4th; T. xiphioides var lutea, a larger spike with definite pale yellow flowers. (I hope the photo's show the colour). As the new flowers push out they are almost a canary yellow colour that seems to fade a little as the flowers fully open. All these plants have a beautiful fragrances, each slightly different, with xiphioides var lutea being the most pungent according to the boss,(that being Leanne)." Peter Tristram 03/11/13 ... " (comparison photo) The photos are fine and the colour is obvious. 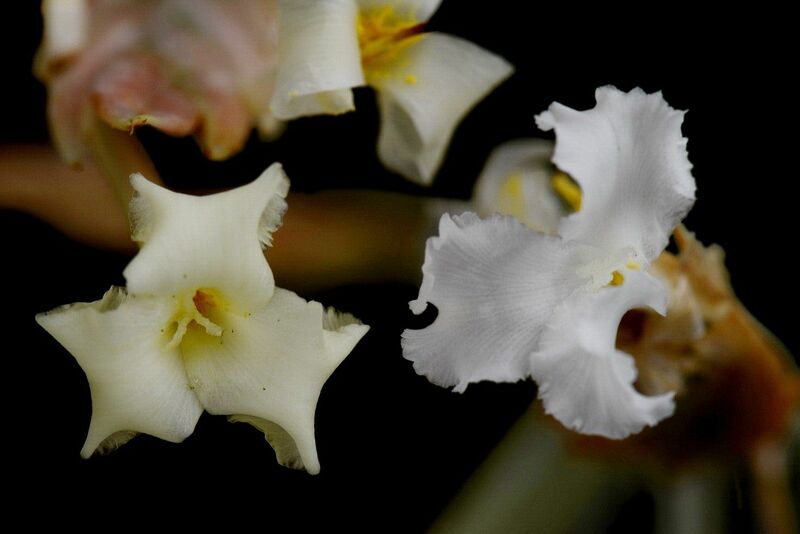 I agree that the lutea form is the most fragrant too. Here is a comparison shot as well. Too damned hot today to take better photos!" 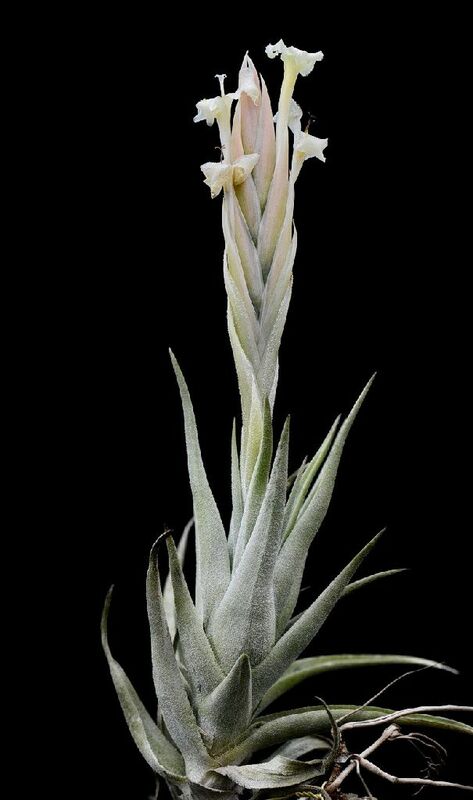 Len Colgan 3/11/13 ... "Thanks for sharing those pictures of forms of T. xiphioides. 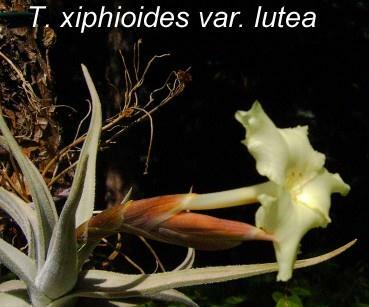 I do not know whether or not it is strictly correct to label the first of them as T. xiphioides var tafiensis. The description of this variety stipulates large purple flowers, and I personally only use this name if that is the case. 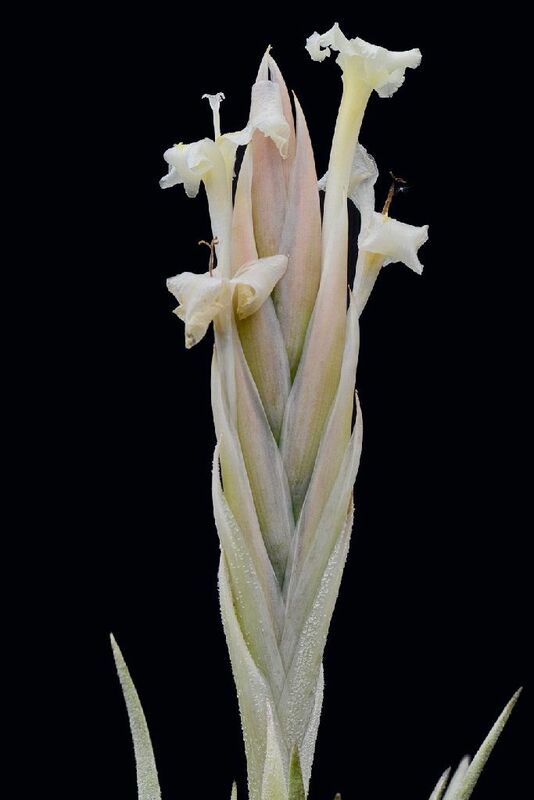 However, in the USA, they do not have the purple flowered form, and use the var tafiensis tag for any very scurfy forms, undoubtedly with white flowers, whether or not they come from anywhere near Tafi in Argentina. The second form from Germany most probably originated from me. Maurice can confirm if that is the case. It is a smaller form with gun-barrel grey leaves, and was collected by the River Mizque in Bolivia. 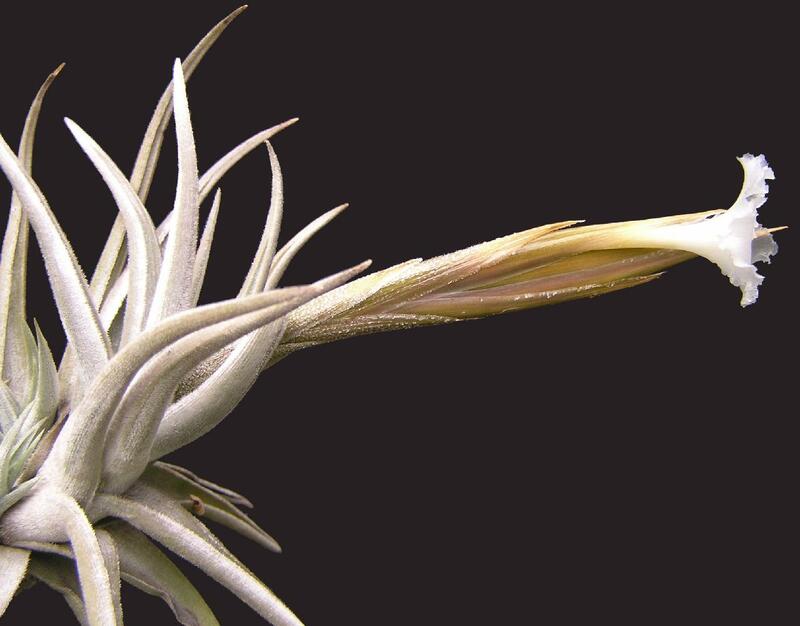 What is really interesting about collecting T. xiphioides in Bolivia, rather than in Argentina, is that widely separated habitats yield quite different forms, making it possible to have a varied mini-collection of T. xiphioides types." Chris Larson 3/11/13 ... "One of the things that Marj Mc & I noted on our trip – my first to Argentina – was that Isley’s tafiensis is very very similar to the form that grows right beside the road just over the ridge out of the Tafi valley – only about 1 or 2 km from the pass (& the only ones we could find at the correct altitude near the Tafi valley) – but still within the state of Tafi. I agree that this is not var tafiensis by the description. The site of the blue flowered var. tafiensis to be found near there (according to Smith & Downs) is some 10 or 15 miles away. Which I never found due to lack of detail on maps at that time – Google maps make life easier for collectors now – but AQIS makes it harder." 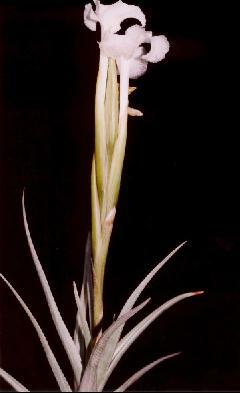 Tillandsia xiphioides Ker-Gawler var. tafiensis L. B. Smith, Phytologia 20: 173. 1970. 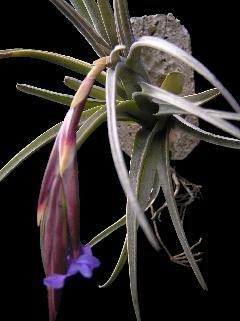 Tillandsia friesii sensu Castellanos, An. Mus. Nac. Hist. Nat. Buenos Aires 37: 501, pl. 1. 1933; in part, non Mez, 1906. Leaf-scales with narrow lobes, making the leaves tomentose-lepidote. 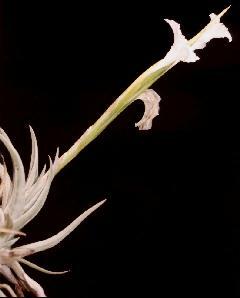 Floral bracts 5-6 cm long. Sepals 30 mm long; Petals violet. Type. Schreiter 7176 (holotype US, isotypes GH, NY, LIL), Managua (Colalao del Valle), Tafi, Tucuman, Argentina, Dec 1931. Distribution. 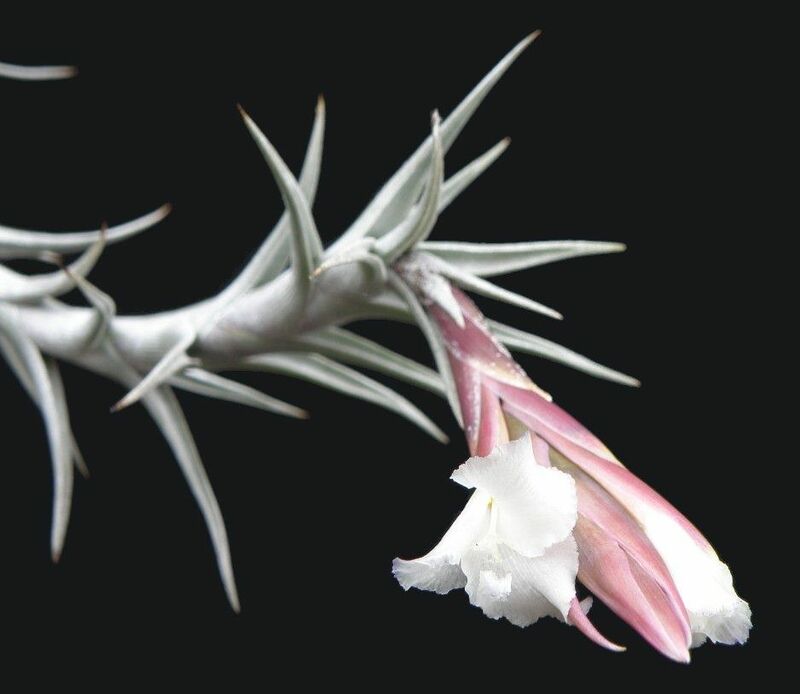 Epiphytic, 2000-3000 m alt, northwestern Argentina. Tucuman, Tafi: Quebrada de Amaicha, El Molle, Nov 1932, Schreiter 8835 (GH, LIL). We have the true blue in Australia and we should not settle for second best. 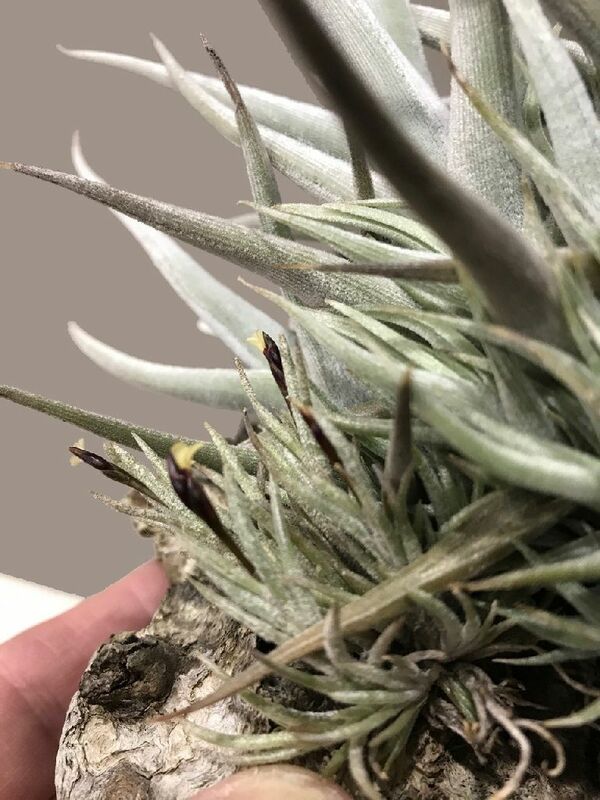 It took me several years to convince Rainforest Flora that they had the wrong name on their plants and there is a possibility this could be the source of wrongly identified stock. Many years ago now in trying to keep up with the latest I did import from Germany only to get white flowers. Luckily the supplier listened to my plea and on the second attempt I got the blue! 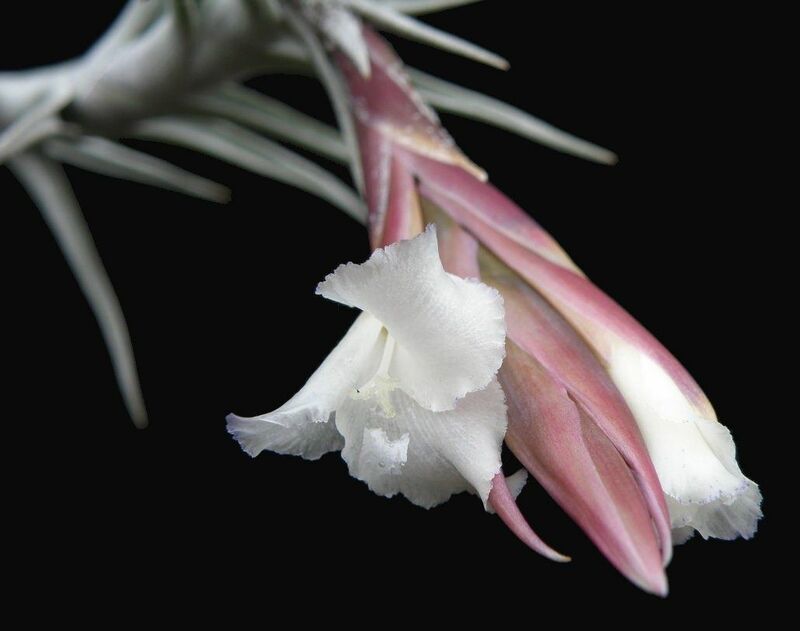 So if your 'tafiensis' flowers white please change the label to straight xiphioides. 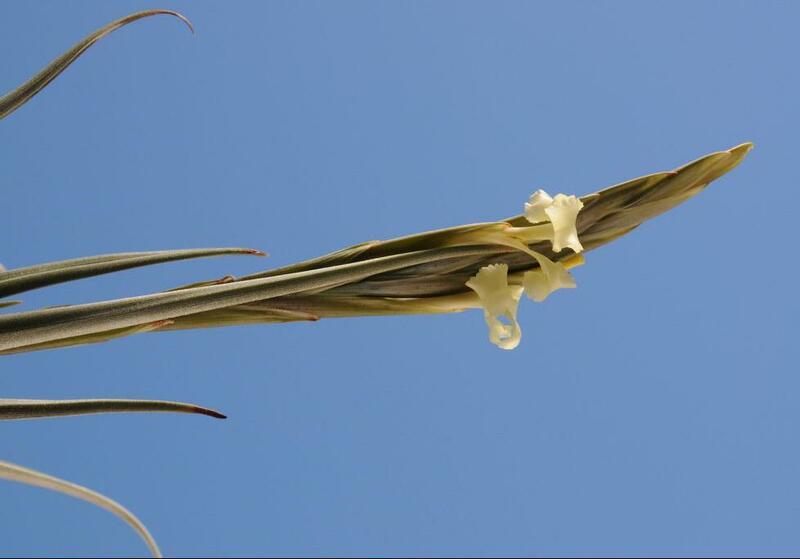 Remember here that 'lutea' only applies if the petals are a yellowish hue." 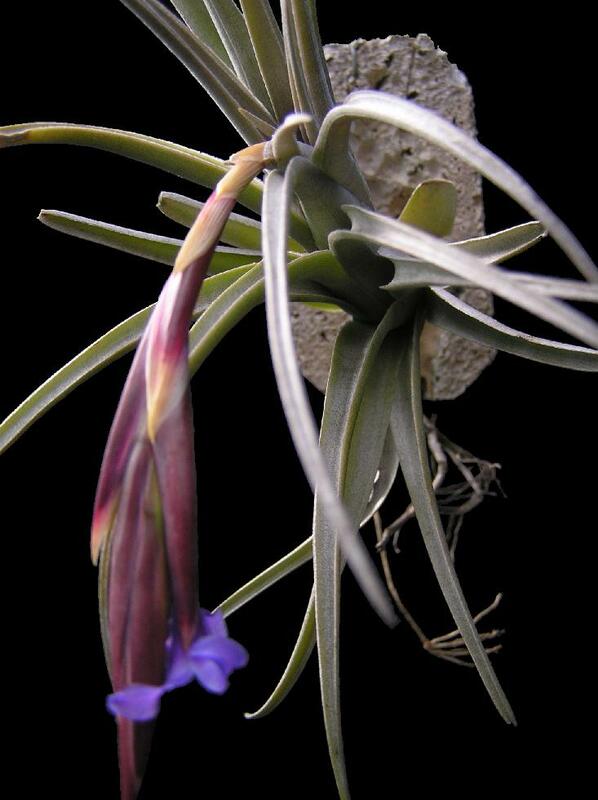 Peter Tristram 14/11/13 ... "Hi all, another white "tafiensis" from Deutschland, from a Botanic Garden as well! At least the luteas are flava." Len Colgan 15/11/13 ... "I know that this could originate from anywhere in Argentina or Bolivia, but it does look like the Rio Mizque form from Bolivia recently shown by Grant. What is your opinion Grant?" Peter Tristram 15/11/13 ... " I’ll ask Uwe – he has access to the Goettingen database." Ray Clark ... "I’ve had this plant for more than six years and this week it has flowered, the tag says T. aizoides, (probably xiphioides minor). Derek passed it to me with a wry grin on his face and said that he "thought that it was grown from seed but from the look of it something was astray! Let’s wait until it flowers and then we’ll know", well here we are. The first flower erupted from nowhere and I would agree, T. xiphioides minor, same flower spike and same delightful fragrance. Then today just as I was about to post I took one more look, the tiny offsets had even tinier yellow flowers on them! The growth reminds me of bandensis but I am not convinced." Derek Butcher ... "In 1998 I got this seedling from Ken Woods that I assumed was T. aizoides but all it did was offset with the older offsets getting a bit bigger each year. Anyone who has grown T. pringlei will know what I mean. Anyway, no flower but as soon as it gets a move to Ray's place it does its deed. Looks like a xiphioides to me." Len Summer's plant, from Len Colgan 01/12. Photo Chris Larson. 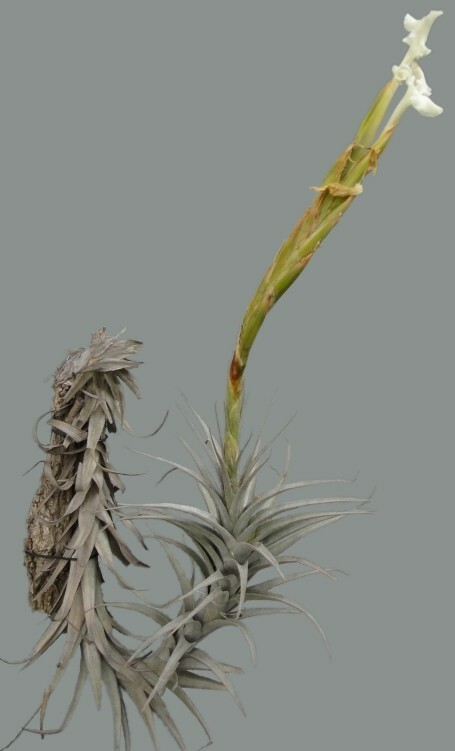 Tillandsia xiphioides Rio Misque form. Ken Woods, Rio Misque form from Bolivia (by D.B.) 11/06. Ray Clark 10/13, from Derek Butcher.